Thinking 'SNOW' but dreaming 'SUMMER'? Park City in the summer can be your special treat but winter is the best. This place is perfect for your family with one of the largest floor plans in the Racquet Club/Park Meadows area. Enjoy a family vacation at a reasonable price within minutes of some of the best skiing in the world. This 1,500 plus square foot comfortable end unit will easily accommodate 8 guests and has space for ten with the fold out queen sized hide-a-bed in the Living Room. We even have a Pack’n play portacrib for a little one! Several recent upgrades make this a great spot for the perfect family vacation. The open, grassy space between units turns into a winter playground and is kid-friendly for a summer game of soccer or an all-out snowball battle off the oversized deck out the Living Room sliders. A new oversized deck in front adds even more space for your enjoyment. The Park Meadows Racquet Club units are located in the best location for all seasons. The views from the second level bedroom show off the awesome slopes of the Park City Mountain Resort. Enjoy the view from the covered, private deck with chairs and table. The view from the master bedroom is of the very private Jack Nicklaus Park Meadows Golf Course. A quick walk down the street brings you to the bus stop for the FREE BUS service every 20 minutes, with bike racks and ski racks on the buses. It will deliver you to all the resorts, into downtown historic Park City, or even out to the outlet stores for some great shopping at all your favorites – Old Navy, Eddie Bauer, Banana Republic, Nike, and Gap. For you cycling enthusiasts, Park City has some of the best terrain for mountain biking and has miles and miles of bike trails off the main roads. Park City is located 36 miles from the Salt Lake International Airport and if you don’t want to rent a car, airport transportation is easy. You will be within 10 minutes of 3 world class ski resorts that have great bike trails during the summer. On the free bus routes: Park City Mountain Resort, Deer Valley and The Canyons. Inside of an hour you can be at Alta, Brighton, Snowbird or Solitude or even out to Robert Redford’s Sundance Mountain. The Olympic Park lets you relive the excitement of the 2002 Winter Olympics as you watch athletes train for the next winter games. Summer and fall offer a completely different set of opportunities - mountain biking, hiking, golf, public reservoirs for water fun like fishing, boating, or sailing. As you sit on the deck enjoying your morning coffee, you can watch hot air balloons glide overhead effortlessly. The hillsides come alive as they burst into vibrant red and gold as fall approaches. There are ziplines, alpine slides, an alpine coaster and many other rides available at both the Park City Resort or the Olympic Park. For you golfers, while we are located on the Park Meadows course, it is private. But, Park City Municipal Course and the new challenging Canyons Course are 5 minutes away and there are a matter of eight – 18 hole courses within a 30 minute drive! And all reasonably priced! During the winter months, the golf courses make wonderful snowshoe and cross-country skiing trails. Or, try a romantic sleigh ride up the slopes of Park City Mountain Resort to the Snowed Inn! The PC MARC Fitness Center is just steps away and offers a wide assortment of classes such as yoga, pilates or water aerobics as well as a full work out facility. It boasts indoor and outdoor tennis facilities, 2 swimming pools during the summer months, hot tubs, meeting and game rooms, a boulder-climbing wall, indoor track and much more! The facility has undergone a major renovation and is a member of the SILVER SNEAKERS Program for Seniors. We’ve tried to stock the kitchen with all the tools you might need: service for 12, lots of wine glasses, coffee maker, blender, crockpot, lots of pots and pans, dishwasher, microwave, and upgraded gas stove. And if you’re not interested in cooking, there are lots and lots of places that will deliver. You’re just five minutes (or a brief bike ride) from the grocery store. We have recently remodeled - opening up the living and kitchen area and adding a full bath in the loft area. Accommodations include: one king size bed, one queen sized bed, 2 twin beds, a trundle bed that makes into 2 twins or one king size bed, queen sized hide-a-bed in the Living Room and portable crib. Linens provided for all beds; three full bathrooms and one half bath; washer and dryer. Our guests will stay linked to home with FREE WIFI internet service. Board games and a large video library are available at your fingertips. TV, VCR, DVD and stereo in the Living Room are yours to enjoy in front of the gas fireplace. Huge dining table can easily seat the whole gang with four more at the breakfast bar. You’ll never get bored in Park City. This quaint little town is the home of the Sundance Film Festival every year and has numerous art galleries and some of the finest 5 star restaurants. Look for the wonderful free concerts at Deer Valley during the summer evenings or on Sundays as part of the 'Park Silly Sunday' street fair. Don't forget to go to 'Java Cows' for dessert! Contact us early for your winter or summer vacation - we tend to get booked early for those 'prime-time' dates. Very nice, newly renovated place. Great location. Owners are very accommodating! Place was large enough for our group of 6 people. Location was perfect for our ski vacation, closeby to both Park City and Canyons resorts, as well as the town. Kitchen was well stocked- having pretty much everything we needed for the nights we cooked. Bedrooms and bathrooms were comfortable and clean, stocked with plenty of linens, towels, sheets, and blankets. I’d definitely recommend this place for any group or family looking to do a Park City vacation. Conveniently located, well appointed, comfortable. 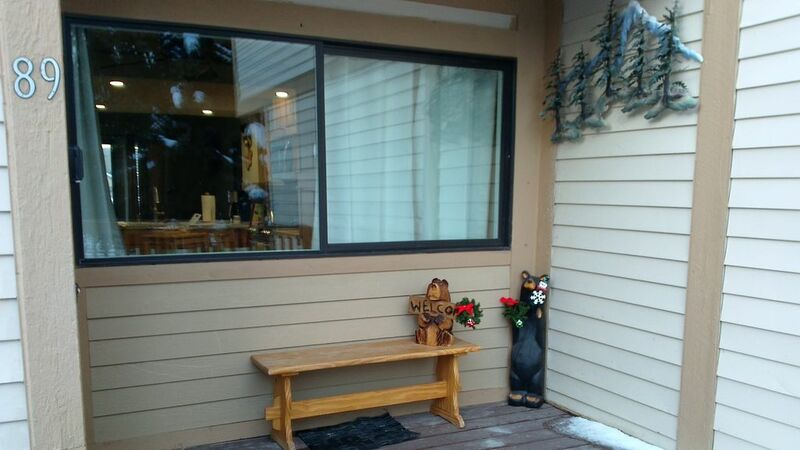 Located a short distance from the center of town and the slopes, we found the location very convenient. The layout provided space and comfort for our family of four adults and two children. The kitchen is open and well appointed, with more than just the basics. Garage parking was a plus. The owners were friendly and helpful. There were plenty of games and distractions for the kids. Thanks for the nice review! We are continuing to make improvements for our guests and it is nice to hear they work well. Enjoyed working with you! We stayed a month and liked the Racket Club area so much we are coming back for two months next summer. Kitchen has it all --- every gadget and an upgraded gas stove. We cooked most of our evening meals on the BBQ and ate on the back deck. Inside dining area is cramped but there were only two of us staying so no big deal. Master bed was extremely comfortable and our one weekend guest said the guest bed was also. Location a few steps from the Park City MARC (fitness facility with very reasonable monthly pass rates) and free busses to get downtown or connect all other areas made life easy to both play and save on gas/parking. Be sure to take advantage of the Farmers Market at the Seasons complex on Wednesdays -- they even had a used golf ball stand! Tish was a marvelous remote hostess with immediate answers to the few questions we asked right after arriving. We have many friends who rent condos in other newer complexes but for us the convenient location of the Racket Club trumps newer big time. We'll start by saying that the owners were great to work with and were very helpful. Their property Mgr. Aggie was also very helpful and knowledgeable of the area. Couldn't ask for better. The description of this property was very accurate. Of the Park City area, this Condo is situated in a great location. It is located right in the middle of everything. This condo has a great deck with a BBQ. There's lots of lawn space for kids, dogs, or adults to play on. It is close to the bus stop and you may ride the bus anywhere within Park City. Its free and you'll avoid the hassles of parking. The kitchen is well stocked with all one needs to cook with if you don't go out. The neighborhood is quiet and friendly. The activities and attractions are endless. We had a great time and are looking towards going back next year. We would and have already recommended this condo to family and friends. Had a fantastic time with 5 other girlfriends. Plenty of space for sleeping and 3 bathrooms was key. The living space was great for sitting around and talking - which we did the entire time. We did manage to get out a few times and were able to get to everything fun within a few minutes of driving. Would be happy to bring my family back. The place is a good value for the price. The condo was very clean and well equipped. The listing is mostly accurate. The "third" bedroom is really a loft located within the upstairs second bedroom. There is no privacy between the loft and the lower part of the bedroom. We were under the impression that there were two private bedrooms and then a loft attached to some other part of the condo. Since we were all family, it wasn't a huge deal, but if you are traveling as couples, the lack of privacy might become an issue. The condo was conveniently located for our purposes and very quiet. The living room furniture is dated but comfortable. The kitchen is well stocked, but very tiny, not big enough for two people to be in at the same time. The pictures make the condo seem larger than it is in person so keep that in mind if you are looking for a spacious place to relax. They have a deck with a full, enclosed railing and gate which was nice since we brought pets along. We had a small problem with operating the TV, but the local property manager fixed that issue within an hour which was nice.